Young entrepreneur, Willan Mark, has advanced to the next round in the keenly contested Caribbean Call to Action Entrepreneurship Challenge — after 24 persons presented their ideas on Sunday, 3 May, as the 3 day Caribbean Young Leaders Entrepreneurship Boot Camp came to a close in Barbados. The others are: Barbadians Joshua Forte and Nikele Davis; Devin Odlum of Antigua & Barbuda; Jenell Pierre of Guyana; Janice McLeod and Shamoy Hajare of Jamaica; Magaran Joseph of St Lucia; Vincent Polak of Suriname; and Josanne Arnold, Vijay Dialsingh and Korice Nancis of Trinidad & Tobago. They all move forward to the next stage of the challenge, which is an initiative of the Global Leadership Coalition (GLC), A Million for A Billion (1M1B), and the Caribbean Centre of Excellence for Sustainable Livelihoods (CoESL). During the Boot Camp, the participants got advice and guidance from volunteered mentors on how to turn their ideas into viable businesses. 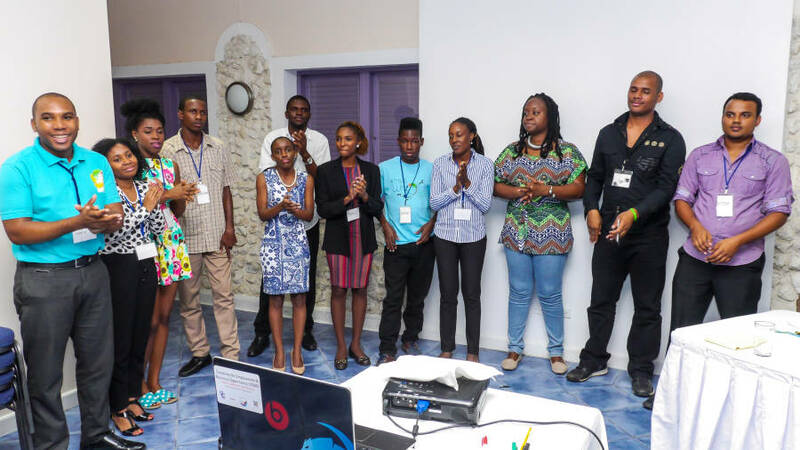 At the close, they presented their projects to judges James Husbands, Leslie Walling, Jean Lloyd, Marcia Brandon, Hashim Ruan, and Mark Ifill in the Bresmay Conference Room at Infinity on the Beach in St Lawrence Gap, Christ Church. Walling acknowledged that it was tough choosing the top performers; so much so, that the judges had agreed to advance more of the participants than originally planned. “It’s very clear that each of you put a lot of work into this. We know this, because you made our job very hard. We had to look very carefully at the presentations, and it was such a tight race that there were a number of draws, so instead of 10 we will have 12 people going forward,” he said, before announcing the winners to an expectant gathering of entrepreneurs, mentors, facilitators and donors. Addressing the closing ceremony, UN Women Deputy Representative for the UN Women Multi-Country Office – Caribbean, Tonni Brodber, said she was impressed by the projects. “What I have seen here is bold thinking and bold movement and that’s what we need for economic empowerment in the Caribbean,” she said. She further advised those who did not advance in the challenge not to give up on establishing businesses. Brodber encouraged them to continue working on their ideas, but to accept that they may eventually have to move on to something different. “Sometimes you may have to say goodbye to the idea, and think about something new — because on one path you realize ‘maybe I should have gone this way instead, because this is really where the need lies, and this is where my comparative advantage is with that need’,” she said. Over the coming weeks, the chosen 12 will participate in an online course on entrepreneurship basics and will be required to log in every week for mentoring sessions.